I showed the card to the collections staff and, like the good historians they are, they were appropriately skeptical. Donors can’t always be taken at their word, and museums have an obligation to provide the public with accurate, well-researched information. Without any additional information it would be unwise to take the record at its word. But short of a DNA test, would it ever be possible to verify the scarf’s history? As a student of fashion and textile history, I hoped that I could get closer to the answer. What kinds of scarves were fashionable in 1865? What sort of clothes did Mrs. Lincoln wear? Did anyone record what she was wearing the night of the assassination? Is it likely that her clothing was stained with blood? Considering the sheer volume of Lincoln scholarship that is produced each year, I was surprised to find very little information about what Mrs. Lincoln was wearing on the night of the assassination. Secondary sources were silent and primary references were scarce. The Chicago Historical Society may have a bloody cloak from that night (their research into its history is chronicled in a fascinating website) but no other museum has firm claims to anything else. In a book of eyewitness accounts, only two made reference to Mrs. Lincoln’s attire, and the descriptions contradicted each other. Artist’s depictions of the scene also seem to have no consensus. One shows her in a low-necked evening gown and a wreath of flowers in her hair, while another depicts a high-necked dress and a bonnet. While this information didn’t lead me to a definitive answer, it was helpful to know that the details of her attire were not common knowledge. At least I knew this wasn’t the Lincoln equivalent of a green pantsuit claiming to be from the Kennedy assassination. Figure 2. 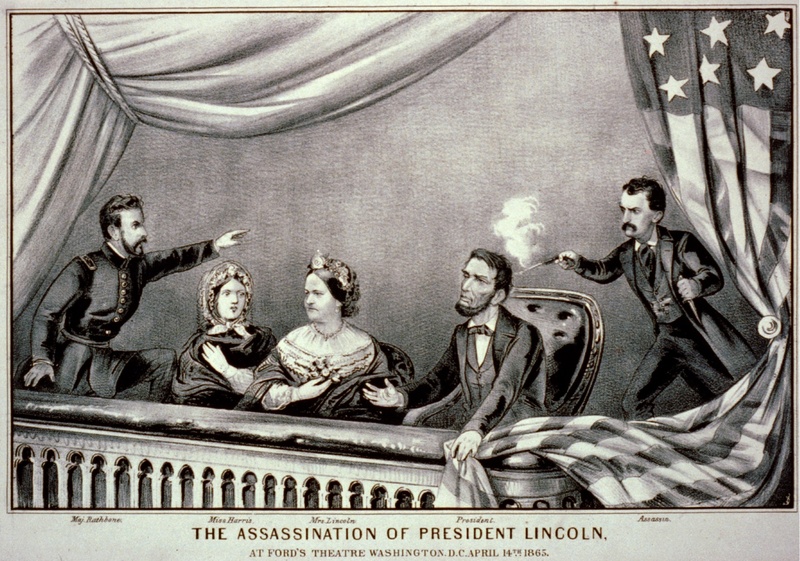 Currier & Ives, The Assassination of President Lincoln, Lithograph, 1865, Library of Congress, Washington D.C. Figure 3. Anonymous, The Martyr of Liberty, c.1865. Library of Congress, Stern Collection, Rare Book and Special Collections Division. Next I found out a little about Mary Lincoln’s style. The First Lady was actually an avid follower of fashion—to the point that it was a point of controversy in the press. She felt it was her duty to dress elegantly (and prove to the east-coast elite that Illinois wasn’t full of hicks), but many in the press felt it was inappropriate to spend so much money on clothes during wartime. Figure 4. 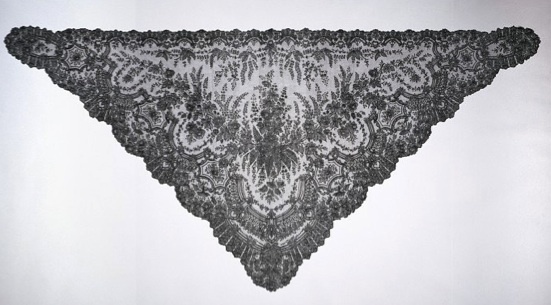 Unknown maker, Black Lace Shawl, silk bobbin lace, 142.5 X 290 cm, 1860-1870, Victoria &Albert Museum, London. Assuming that the First Lady would have been in style, I researched fashionable scarves of the day. While there were many different options and styles, the dominant theme seemed to be large triangular wraps [Figure 4]. When I examined the scarf I found that it was rectangular in shape with scattered reddish brown stains. 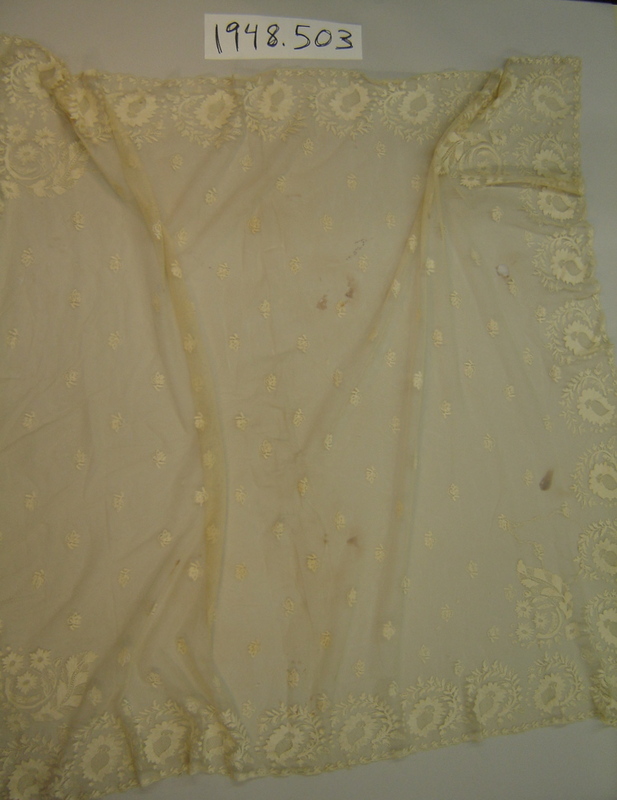 However, the stains mirrored each other along a vertical axis, indicating that the scarf was folded into a narrow rectangle at the time it was stained. Lastly, I read up on details of the assassination and tried to figure out exactly how “splattered” with blood Mrs. Lincoln might have been. The light pattern on the scarf implies an impact—as you would expect someone to receive as a bystander to a violent event. But President Lincoln didn’t actually bleed much initially and it was only after a doctor removed the bullet that there was substantial blood from the head wound. I am certainly no blood spatter expert, but the sources implied that the initial act would not have created a splash of blood, but if Mrs. Lincoln held her husband’s head after the bullet was removed (as some accounts state) her clothing would have substantial stains rather than light spots. In the end, I determined that the scarf’s connection to the assassination was unlikely. I did however find out that the owner of the home in which Lincoln died, later did a brisk business in allowing “souvenir” seekers to take bloody relics from the house. Museums across America have scraps of sheets, curtains, and floorboards that were supposedly taken from the room in which Lincoln died. It does not seem to be much of a stretch to imagine that at some point, someone started making fake souvenirs. Since the style of the scarf seems inappropriate for the time, it is possible that this “relic” was created decades after the event—when the fashions of a particular year were forgotten and a lace scarf seemed sufficiently “old timey” to be believable. Baker, Jean H. Mary Todd Lincoln: A Biography. New York: W.W. Norton & Company, 1987. Clinton, Catherine. Mrs. Lincoln: A Life. New York: Harper Collins, 2009. 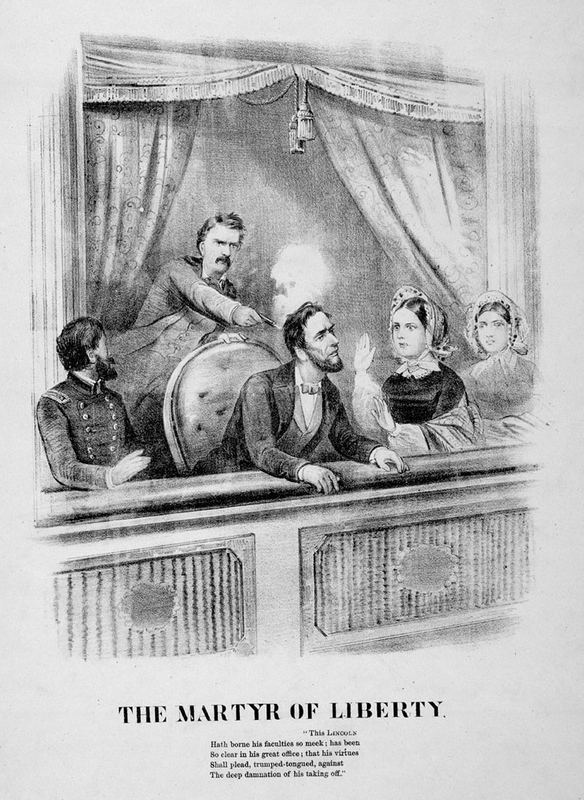 Good, Timothy S. We Saw Lincoln Shot: One Hundred Eyewitness Accounts. Jackson: University Press of Mississippi, 1995. White House. New York: Arno Press and The New York Times, 1968. Levey, Santina M. Lace: A History. London: Victoria & Albert Museum, 1983. This entry was posted in Uncategorized and tagged Clara Berg, First Lady, Mary Todd Lincoln, Museum of History and Industry, Seattle, The Chicago Historical Society. Bookmark the permalink.